Margaret St. Clair – The Future is Female! 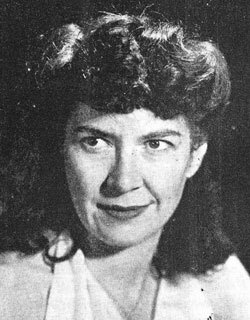 Margaret St. Clair circa 1946. Margaret St. Clair (February 17, 1911–November 22, 1995) was born Eva Margaret Neeley in Hutchinson, Kansas. The only child of Eva Margaret (Hostetler) Neeley and George Neeley, a recently elected Congressman, she spent some of her early years in Washington, D.C. When her father died of influenza in 1919, St. Clair moved with her mother to Lawrence, Kansas, and then, in 1928, to Los Angeles, where she finished high school. She married Raymond Earl (“Eric”) St. Clair shortly after completing her Berkeley undergraduate degree in 1932; two years later Berkeley awarded her a master’s degree in Greek classics. After a trip to China, the couple settled in El Sobrante, California, where they owned St. Clair Rare Bulb Gardens (1937–41) and where she raised and sold Dachshunds. During World War II, she took a “brief and unsatisfactory” job as a welder. 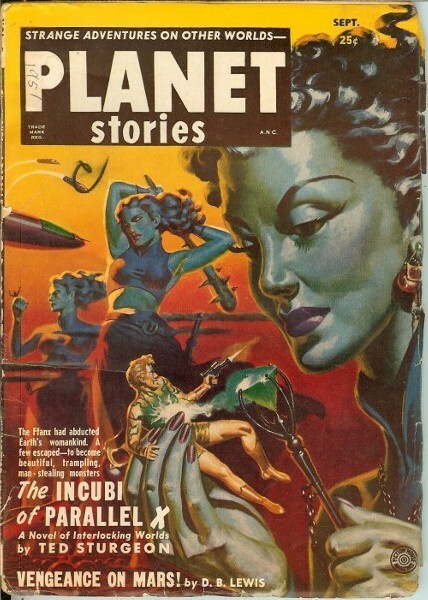 St. Clair started her career as a professional writer in the mid-1940s, publishing both detective fiction (beginning with “Letter from the Deceased” in the May 1945 Street & Smith’s Detective Story Magazine) and science fiction (beginning with “Rocket to Limbo” in Fantastic Adventures, November 1946). By the 1950s she had focused on the latter genre: more than seventy of her science fiction stories appeared in print over the course of that decade (some under the pseudonyms Idris Seabright and Wilton Hazzard) along with her first novels, Agent of the Unknown (1956) and The Green Queen (1956). St. Clair’s stories were popular with readers and television viewers alike; her short story “Mrs. Hawk” (1950) was filmed for the 1961 season of Thriller, while “The Boy Who Predicted Earthquakes” (1950) and “Brenda” (1954) were filmed as segments for the 1971 season of Rod Serling’s Night Gallery. St. Clair’s later writings, particularly Sign of the Labrys (1963) and The Shadow People (1969), reflect an increasing interest in neopaganism; in 1966, she and her husband were inducted into the Wiccan religion under the names Froniga and Weyland. In a 1981 interview, she reported she was at work on two novels never published, The Euthanasiasts and The Once and Future Queen. After her husband’s death in 1986 she moved to a retirement community in Santa Rosa, California, where she died at eighty-four. Her papers are archived at the University of California-Riverside.